Customer Experience is powerful. It decides whether a customer is content or ready for something else. The fate of your revenue relies on how to keep customers happy. Getting to know your customers and understanding what keeps them happy is paramount. Customer Experience is not optional. Businesses can no longer decide what’s best for customers. After all, customers have choices – many choices. Customers want rich, engaging experiences with the solutions they use. B2C businesses were quick to adapt enriching the customer experience, but B2B companies are slowly catching up. 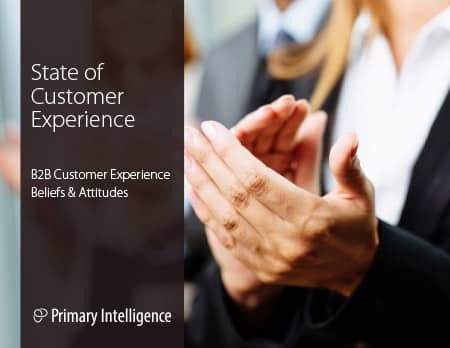 In this eBook, you’ll discover the top beliefs and attitudes B2B marketing, sales, and Voice of the Customer professionals have toward Customer Experience, their significance, and recommendations you can implement at your organization. You’ll also get recommendations for understanding Customer Experience beliefs and attitudes from the B2B perspective. Are you giving your customers the most engaging experiences?